Map of predicted independence referendum results. Based on this map by Interfector. Yesterday’s prediction of ward results in the independence referendum was sorted by the percentage of Yes votes. 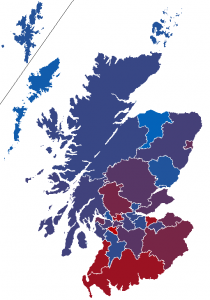 However, it might be instructive to list the same figures by council area, and to calculate the results also for the councils (given that Yes Scotland is organised by council area). I’ve also created a map of the council areas to illustrate the prediction. Pure blue is 60% Yes, and pure red is 60% No. I would have loved to create a ward map, too, but I haven’t been able to find a suitable ward map of Scotland, and I don’t have time to create one. If somebody has plenty of time, it should be quite easy to do, however, given that ward maps are generally easy to find for each council area. The boundaries in the shapefile scotland_and_wales_const_region.shp look like they’re congruent with your ward listing, but teh names are different. Now might not be the time for you to learn mad GIS skillz, but there are some nice packages for styling shapefiles into statistical maps. Interesting. It’s probably overkill for my purpose, but if I get bored one day I’ll look into it. Thanks! Thanks for the great work. Very interesting site all round. Many signs that yes might win this although a big danger is the shy no theory. Good to see so many people interested in voting, debating and deciding their future. Good luck to Scotland and her people.